← Sunday – October 28, 2018 – Elizabeth Glaser Pediatric Aids Foundation Celebrates It’s 30th Anniversary With Annual A Time for Heroes Family Festival – Smashbox Studios – Culver City, CA. 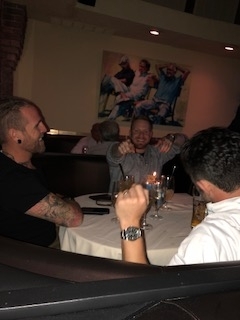 Dinners – Piero’s Italian Cuisine – November 7, 2018 – Las Vegas, NV. 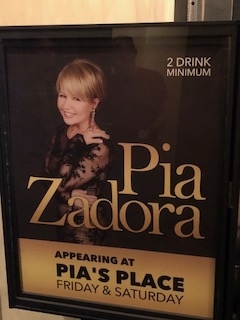 After getting a tasting at the famous Las Vegas Piero’s Italian Cuisine, I ran to tell my Mother’s best friend Ellie Rifkind who lives in the area. She was so excited, exclaiming “Oh my god, I am great friends with the owner Freddy Glusman and his family!” His son, Evan Glusman arranged my terrific tasting. Her late husband Julie Rifkind had his 75th birthday party at Piero’s. So before I even walked in the door, I felt like I was family. 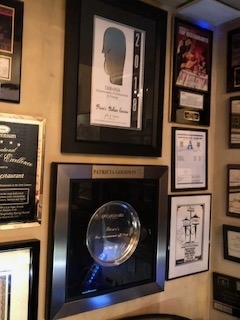 In 1982 Freddie Glusman opened Piero’s Italian Cuisine on Karen Avenue. 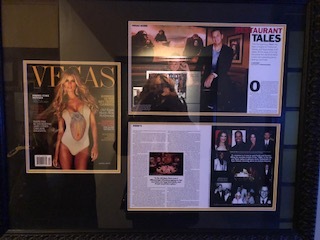 It quickly became a hangout for Las Vegas locals and Celebrities like the Rat Pack and Politicians. 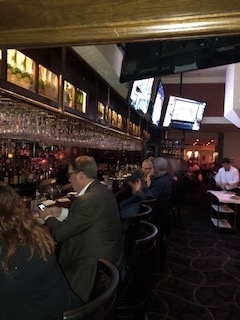 It especially became a favorite place for Italian businessmen in the casino industry commonly referred to as the “local color”. Once you’re inside, you feel like you’re in a time warp, back in the 80’s with a hint of a Las Vegas mobster vibe. After all, they did film a portion of the movie “Casino” here. Scorsese chose to film some dinner scenes at Piero’s, which starred Robert De Niro, Joe Pesci, and Sharon Stone. You can recall the whole scene with Robert De Niro and Sharon Stone once you’re sitting in one of their iconic leather banquettes. The Italian restaurant is a big reminder of old-school Vegas and was called “The Leaning Tower” in the movie. They are known for their martins, so of course I had to try a few.Every martini is made in a 10oz. glass and shaken tableside in a proper martini shaker. Lemon Drop – This drink had just enough vodka and lemon essence─a great drink! 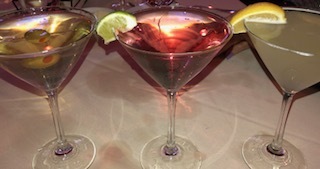 Cosmopolitan – A very proper Cosmo. Delicious and refreshing! 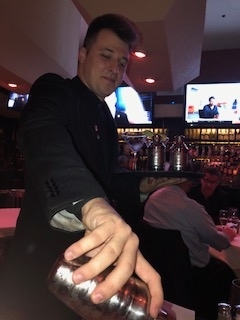 Kettle One Martini – My go-to martini, the best one here! Joe’s Stone Crab Claws are the best thing you’re ever going to eat in your life. They are hard to come by, but WOW. Worth it every time and trip during the season. The best crab on the planet. 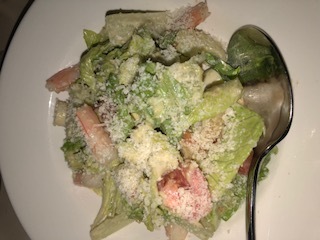 Garbage Cesar Salad, is a famous rendition of a typical Caesar salad, with hearts of palm. It hits the spot. 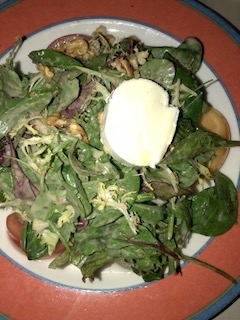 Spring Salad, perhaps a healthier salad to order, fresh and lovely. 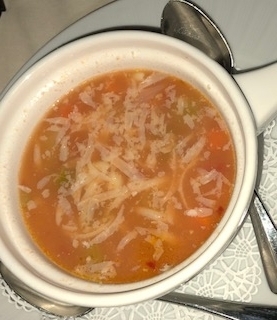 Pasta Fagioli Soup, I can always detect what a restaurant has to offer by tasting the soup, and this soup was rich, full-bodied and great. A significant indication of great things to come. Aragosta Alla Griglia, fresh Maine lobster broiled, served with melted butter. What can I say except for a truly perfect Entree? 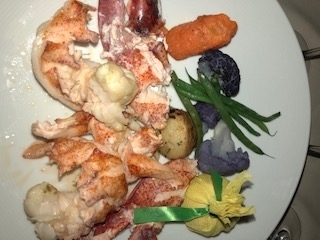 The lobster is moist and delicious–what a treat! 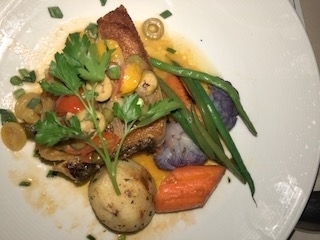 Chilean Sea Bass, fresh and light, a tender cooked fish, just a fantastic fish dish. I would not want it prepared any other way. Fettuccine a Modo Mio, made with fresh egg noodles, broccoli, porcini mushrooms, pancetta, cream and a touch of tomato. This pasta was one of my favorite menu items. 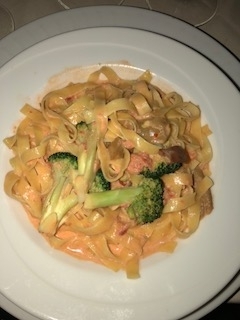 The pasta itself is delicate and fluffy, the sauce is light with excellent porcini flavor, yum! 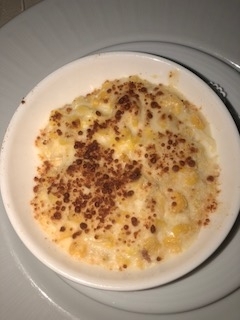 Creamed Corn, a fantastic rich dish, just spectacular! Crème Brule, nice crackle top with a sweet, creamy consistency, delicious. 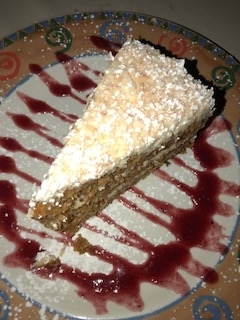 Carrot Cake, a huge multi-layer carrot cake, very traditional. Resolute, Chardonnay, Napa – 2016. This wine has a delicate fruity aroma with a great feel in the mouth, and it was fantastic with the crab. Michael David, Chardonnay, Lodi – 2016. Another terrific wine, with a delicate buttery bouquet, a great addition to the lobster. Turley Juvenile, Zinfandel, Napa – 2016. I am all about the Zinfandel, and this one does not disappoint, great with the Garbage Salad. The menu is the same as it was when the restaurant opened with many nightly specials. The decor includes Aldo Luongo lithographs, original oils by José Bellver, and huge fresh floral displays on antique pine tables. 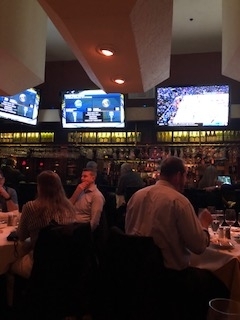 Piero’s is known for its fabulous cuisine, unique atmosphere, and its five-star service. 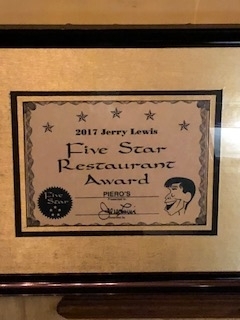 They were even awarded the “DiRoNA Achievement of Distinction in Dining” in 2018. What can I say about Piero’s? It is the best old-school Italian you will find in the area! 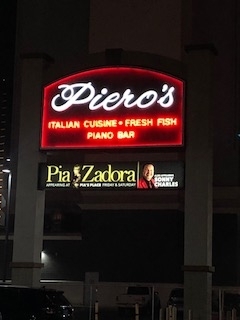 When in Las Vegas go to Piero’s. “Legendary Dining Since 1982”, a motto that they truly live up too! * Note some content was taken off their website.